It's been ten years since we first met the Penderwick sisters in the award winning story about family, a vacation adventure and the kinds of small mysteries that can seem very important. 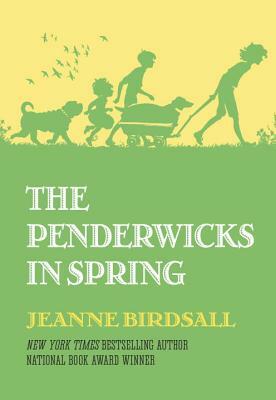 The Penderwicks continues to be popular, because of it's timeless and charming feel and because of the emotional depth of the four girls who range in age from four to eleven and who have such fascinatingly different characters. The newest Penderwicks book was published last month, it's called The Penderwicks in Spring and it focuses on Batty, who is now eleven and her younger siblings Ben and Lydia. Of course, the older sisters still play a vital role in the story, but most of them are away at college or behaving in unintelligibly teenage ways. Batty is trying to find out where she fits in this enormous family. Her self-confidence is at a low ebb and she does get quite sad, but the book still proves to be fresh, funny and eventually redemptive. I loved this book, it made me laugh and cry. So much beautiful writing and insightful character. A truly lovely book with a very wide appeal.